Lisa Lloyd, antiques specialist, TV presenter and writer is the owner of Hand of Glory Antiques in Wiltshire and has been in the antiques business for thirty years. She has previously worked as an auctioneer and director of Rosebery’s Auctioneers in London, but you may know her as a Miscellaneous specialist on BBC Antiques Roadshow, for which she’s worked since 2012. We’re really lucky to have Lisa working with us on the refurbishment and interior design of The Bull. She’s got a fantastic eye for authentic, heritage and beautiful pieces – large and small – and very importantly, she also has a great nose for a bargain! Lisa has been working with Design Twenty-Five interior design and Enterprising Limpsfield management teams to help source beautiful and authentic, furniture, fittings and accessories for The Bull and advising on authenticity and appropriateness. Her daughter, Tallulah, a talented artist studying fine art at Bath Spa University is also helping the team to recreate artwork that will look amazing in the newly refurbished spaces. Where did your love of antiques come from? I’ve had a love of history from a very early age and was one of those strange children who spent their pocket money in antique and junk shops. I’ve also always been fascinated by historic houses and my holiday of choice, even as a child, would be to visit museums and old houses. You have worked with many great venues to help source antiques for clients and interior design projects. What have been your favourite projects to date? I’ve supplied antiques for many country house and boutique hotels such as Cliveden and many of the Soho House hotels. I am currently furnishing a Regency villa in Wiltshire and have just finished a medieval cottage in Devizes. Probably my favourite project was restoring and furnishing a small 17th century Chateau that my husband and I bought on a whim in South West France – it allowed me to truly indulge my love of French antiques. Aside from working with your husband (Marc Allum), what do you love about working on Antiques Roadshow?! I feel very honoured to be part of a hugely knowledgeable team of specialists. We visit some amazing venues all over the country and frequently come to Kent and Surrey, meeting many interesting owners with a huge variety, and sometimes very surprising items. We never know what’s going to turn up on the day and that’s all part of the fun of working on the programme. Marc and I don’t always work on the same shows, but it is nice when we do! How did you become involved with Enterprising Limpsfield and what interests you about this project? I was very flattered to be asked to be involved with the refurbishment of The Bull. I’ve known Adrienne Gray for many years, so she’s familiar with some of the projects I’ve undertaken. Restoring historic buildings is something of a personal passion and it’s always a pleasure to see new life brought into an old building. How does The Bull inspire you in terms of sourcing items for this particular building? 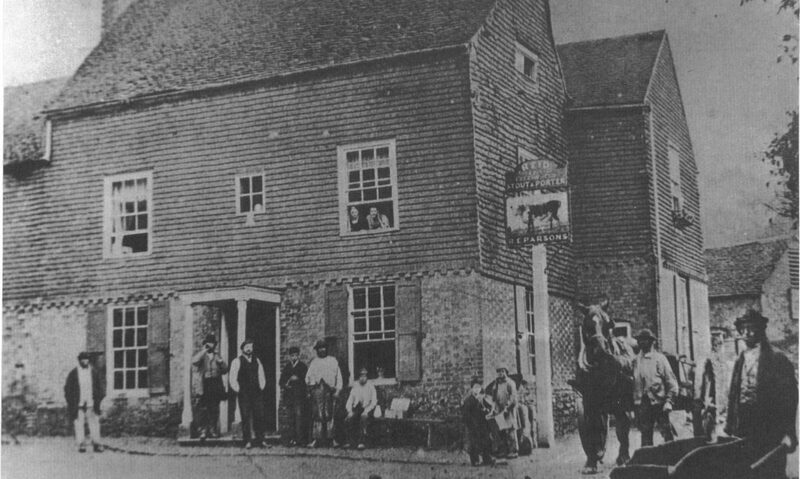 The Bull is a historic landmark in Limpsfield and we’re looking forward to visiting The Bull when it re-opens in the autumn. I’ve tried to source a mix of antiques and interesting fittings for the interiors, complementing operational functionality. The aim is to make it feel as if it’s evolved over time and to have a modern welcoming feel, whilst retaining the great character of the building. What are your main ways of finding interesting and unique pieces? Auctions are my favourite way of sourcing interesting and unusual items. In any given week I probably view 5 or 6 auctions in person and many more online. Also, having worked in the antiques business for nearly thirty years I have a wide range of contacts I can call on if I’m looking for any items in particular. What are your fab finds for The Bull so far and what are you currently looking for? I’ve bought the most amazing marble topped Regency sideboard for the private dining room. It’s a huge piece from a country house in Suffolk and dates from circa 1810. The dealer sold it to me at an extremely reasonable price, as he’s never forgotten that I gave him his first job straight out of university 20 years ago! I’m currently still looking for some unusual light fittings, artwork and of course more chairs. Previous PostPrevious July update – we’re getting on blooming brilliantly! Next PostNext August update – refurbs, focus groups and more!